The art of selling hinges its success on human interaction. But sadly, the nuances of identifying and dealing with varied personalities you encounter in your sales journey is ignored during sales training. 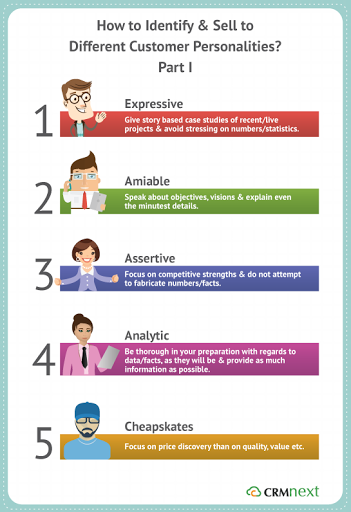 To be a great sales professional, you need to be aware of different personality types, its characteristics and the best way to put your product/service across. This kind of individuals gives priority to relationships above everything else. They value building rapport, mutual respect and friendship. They give priority to other members. They take opinions of all into consideration. Though a people pleaser, they are owners of a strong personality. They bring others to their viewpoints through insightful discussions. Expressive individuals are very sure on their knowledge and belief system and often, take the first approach in networking. They are always interested in a good story (read case study) which focuses more on an ongoing partnership than past glories. Take care not to put too much numbers and facts as this may turn them off. Give story based case studies of recent/live projects & avoid stressing on numbers/statistics. They are similar with expressive personalities in many aspects. They are on the lookout for new activities that require out of the box solutions. Though energetic, they often lack in-depth research skills and require hands on guidance. Their primary focus is on building relationships and hence, their decisions making tends to be on the slow track. Sales cycle tend to be longer with these individuals. Amiable people are one of the best listeners and are really interested in knowing you both professionally and personally. They are more interested in the overall big picture. Hence, instead of directly pitching your product, talk about the organization’s vision and how you fit in perfectly for achieving it. Spend time in building a relationship by explaining even the minute details as an expert. This personality is one of the best options for cross selling and getting the maximum life-cycle value. Speak about objectives, visions & explain even the minutest details. These individuals have only two missions i.e. to get ahead of competition and achieve all their goals. They chase results over relationships, especially with special focus on bottom lines. They are well versed in stating declarations rather than asking relevant questions. Their body language showcases confidence and enthusiasm. Their emotions tend to border on the extreme. Assertive personalities can see through false statements quickly. Present your case in a very professional manner and increase of doubts, promise to follow up rather than delivering half baked responses. Come straight to the point and focus on showcasing how your product/service can help them get ahead of competition. Focus on competitive strengths & do not attempt to fabricate numbers/facts. Data, numbers are more beloved to them than humans. They are very methodical, detailed and do a thorough research before undertaking any activity. They follow logic and take time in taking decisions. They are more of an introvert. Their conversational tone is direct and very formal. They are great passive listeners. Analytical individuals are never to be rushed. Give them time and space to verify your claims and build trust. It is always safe to assume that they have done their homework and are ready to grill you, especially with data and facts. Be as specific as possible when you give responses. The more information you provide, the happier they will be. Summary:Be thorough in your preparation with regards to data/facts as they will be & provide as much information as possible. Always on the lookout for lowest possible price, they search for bargains in each and every deal. Quality comes second in comparison to price. a. For them, the lowest price bidder is the clear winner. b. They are ready to compromise on quality if it means saving even a few amount. c. They are willing to sacrifice even relationships just to enjoy the lowest costs. number to protect your margins, it is best to drop the negotiation. Summary:Focus on price discovery than on quality, value etc. Selling to different personality types can be mastered with consistent practice and networking. Click here to know the rest of the personality types.